Angus Stewart is a minister in the Protestant Reformed Church. 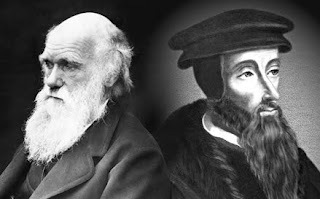 This lecture on "Calvin vs. Darwin: Anniversaries, Origins, Worldviews" from 2009 offers a biographical and doctrinal comparison between John Calvin and Charles Darwin. 2009 marked the 500th anniversary of Calvin's birth (1509) and the 200th anniversary of Darwin's birth (1809). One rarely sees a scholarly treatment of the various beard styles and lengths of notable men of yore. For example, Spurgeon's lack of beardliness was a cause of scorn and mockery among those opposing his ascension to the New Park Street Chapel pulpit. What effect, if any, did Calvin's or Darwin's beards have upon their respective worldviews? Do the depictions of Calvin's well-groomed and luxurious face mane speak to his propriety and meticulous personality? Did Darwin's apparently unkempt and disheveled "angry Santa Claus" beard contribute to his pessimistic worldview, or was it the outward manifestation of his inward struggles? Of course the list might go on, but then we're confronted with the decidedly bald-faced Luther; what to make of this? Perhaps Luther's beard was in and under his face and really present, although not visibly or literally? Thanks for the reminder in the first service today that Christ suffered and gave Himself for us - the just for the unjust. It's ALWAYS good to be reminded of who we were and who we are. The Vision (6/24/10): A Time for "Firsts"
Sermon of the Week: Review of "Crazy Love"
Common Misuses of the Word "Legalism"